Working in the fast changing world of video, I wanted to update my Film School degree because let’s face it, sitting on the bench and cutting actual film is not a necessary skill anymore… go figure. I knew I needed to learn more about the distribution and marketing end of my profession to really stand out from the crowd. I realized that understanding the full cycle enables me to better serve my clients by going beyond just creating a strong brand message and really focusing in on the best distribution and measurement methods to continually improve. While in the program I also finished my first novel, Lana Fray and the Grand Plan. With my own pet project complete I have been able to use many of the new skills I learned about branding, marketing and distribution to market my book in the oversaturated marketplace. I worked full time as a freelance Video Producer throughout the program. It usually worked out well, but there were some professional travel opportunities that made me take a leave of absence, which was easy to do and worked out well. Luckily, it’s not a race to the finish so even though it took me close to four years, it was worth it. There were many great classes, but the two that stand out the most for me is Rick McPhersons’ Business Fundamentals in Digital Communication and Marketing and Branding in Digital Communication taught by Brian Marr. Both classes really taught me how to dive deep into different areas of my work from understanding cash flow to what to consider while creating a brand strategy. 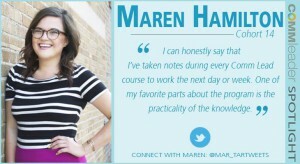 Both McPherson and Marr are professionals with great experience and a clear method on how to structure a class in a way that builds throughout the quarter. Both were incredible experiences. If you wish to become part of an amazing, supportive and creative group look no further than MCDM. The network in the program is one of the best experiences I have ever had. I have learned so much from Anita and the teams’ guidance to the professors’ help in not only coursework but other questions about professional opportunities. Also, I can’t forget to mention the other students with a broad array of experience who are always willing to help and to go out and have fun! My ultimate digital media goal is to be a best-selling author with many digital assets supporting my author brand! Transmedia Storytelling is such a complex but incredible marketing opportunity. I’m curious to see how this continues to develop and reach new lengths. Let’s start with the fact that I do not enjoy seafood (I know bad Seattleite!) I was on a business trip in Japan and my host had me eat little fish that were deep fried whole presented on a plate in various states of mid-swim twists. He was so excited for me to try his favorite thing, I had to crunch through the bones and innards. It was terrible tasting, but made my host so happy I couldn’t help but smile while I tried to mentally kill my gag reflex with my beloved Saki. 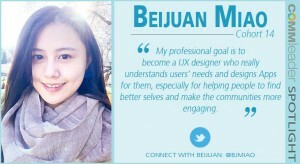 My professional goal is to become a UX designer who really understand users’ needs and design Apps for them, especial for helping people to find better selves and make the communities more engaging. I learned many problem-solving techniques like Essence in Anita’s class, and use it into some questions bothering me for a long time like self-analysis, interpersonal relationships and so on. In Jason’s user experience research class, I gradually learned to think problems in users’ shoes, and think more about others’ needs, which is also very important and helpful for me to get along with others. I am a full-time student, and the schedule of two classes per week is good to me. It allows me to arrange my daytime effectively to study, exercise, relax, or explore the city and our school, but this winter quarter was a challenge to me for the intensive deadlines. Fortunately, I made it! The spring break is coming! Jason’s Foundational User Center Design Methodologies, Advanced User Research and UX Strategies. These two courses led me into the field of UX. Keeping pace with the development of digital media and designing novel and useful apps for people. Area of interest (within the MCDM/MCCN program or in general): Analytics, communication trends. I am the Social Media Specialist for King County (Wash). I work with and support 100+ communications staffers at all levels of county government, from transportation and parks to courts, cops and elections. I oversee a social media program that has nearly 150 different pages engaging nearly 200,000 people, as well as an email and text messaging program that reaches more than 300,000 subscribers. I am one of the youngest people on staff but have embraced the role of “change agent” and are moving us forward 140 characters at a time. I always tell people that I help King County staff do old things in new ways. Whether it’s the way we publish content to the web, engage with local and national media, or listen to public feedback online, there is so much opportunity for growth when it comes to digital media and government. 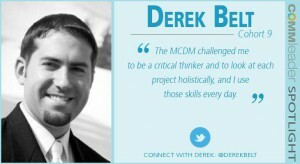 The MCDM challenged me to be a critical thinker and to look at each project holistically, and I use those skills every day. For example, I helped pioneer a new strategy for sending press releases that uses our newsletter service to track the data on which reporters are interested in which topics, such as homelessness and early education. This allows us to build better relationships with reporters in our region, reach out to certain people for exclusives knowing they are legitimately interested in the subject matter, and ultimately tell better stories for the audiences we serve. There wasn’t anything wrong with the old way we were sending press releases—I just had an idea for doing it better. If it ain’t broke, break it. That’s the MCDM in me. Some graduate programs say they work well for people with full-time jobs, but they don’t. The MCDM definitely does, and that was a huge selling point for me. Classes started at 6 p.m. on weeknights so I was able to get to the UW campus easily, and the homework was challenging and rewarding so it was never a burden. I know a lot of people punch their grad school ticket to unlock pay raises or because it looks good on a resume. I wanted those things, too, naturally. But the reason I made the MCDM decision was to put myself in the best possible position to grow. I wanted to soak up as much information as I could from the instructors, learn as much as I could from the talented people in my classes, and apply those learnings immediately to the work I was doing. I think having a full-time job made me a better MCDM student because it gave me a place to implement the stuff I was learning in class. The very first class I took was “Economics of Digital Communication.” I wrote a glowing review of the social media book Groundswell by Josh Bernoff and Charlene Li. That didn’t fly with my instructor, who gave it back to me a few days later and told me to rewrite the report focusing on what I didn’t like about the book. That was the moment I became a critical thinker, and it changed my entire mindset. I have two answers to this. First, I remember devouring the books I had to read for class. I just couldn’t stop reading, and I was highlighting passages and taking notes like I never have before. I carried Post-It notes around with me because I needed to bookmark sections so that I could reference later on. Not for class, but for work. I would read on the bus on my way to the office, get a new idea, and start working on that new idea as soon as I got to my desk. It was a huge rush, and it has never really left me. My other favorite experience was drinking vodka in class one time. We did a client project for “Digital Media Marketing and Branding” with an organic vodka distillery on Bainbridge Island. One of its biggest advantages over the competition was in how the vodka was made—small batches using local grains from local soil. It actually tasted like the earth it came from, rather than the typical metallic taste you get from large-scale producers like Smirnoff who just make as much vodka as they can at once. There’s really not a lot of skill there, whereas our little distillery on Bainbridge was putting in a lot of work to make their product. Anyway, we had to talk about this in class to make our point about some of the marketing we were recommending for the client, and it only made sense to taste test, right? Little samples. Big smiles all around the room. I seriously feel like I’m living it out right now. I spent some time at a digital marketing agency prior to my time at the county, and I always felt like we were on an assembly line. We only worked on small parts of a big project and when we were done the next part would come down the line. I realized early on that I wanted to do something more. I wanted to be part of something big that would take time to develop. That’s just my personality—and I found what I was looking for at King County. We are already doing some compelling work in key areas, but I just love that my career here is still in its first few chapters. This is not a stepping stone for me. I have big plans that are going to take years to deliver on, and that’s exactly what I wanted in a communications career. I’m sure most people would say mobile, and yes that’s something we’re planning for. But I’m really excited about using digital tools to pull in more public feedback. it’s easy to use digital media to “push” information, but it’s much more difficult to “pull” relevant information back in. Social listening isn’t a new idea, but government is always going to be a few steps behind the big-budget private sector trends and we’re quickly on our way to catching up. I want to leverage social listening to give people realistic alternatives to attending public meetings in person. I want to use Twitter to understand public sentiment and thus influence policy through those insights. I want to see if we can use text messaging for two-way customer service. I think we can do all of these things really well. Rattlesnake bites. I went to Arizona to see the Mariners in Spring Training once and we ended up at a restaurant with rattlesnake bites on the appetizer menu. They tasted fine, but I chewed and chewed and chewed and chewed and nothing ever happened. It was like the Everlasting Gobstopper from Charlie and the Chocolate Factory. I finally had to spit it out and move on to something else. Total waste of money. Not sure I have a teaching style, but my general attitude is that students in this program are here for a practical reason and I want to be sure they leave my class with some useful skills to take back to their professional careers. My work gets me invited as a guest and professional at comic conventions. How fun is that? In my Future of Marketing class, each team of students owns a different “scenario” (possible future). I really enjoy hearing how they craft those stories. 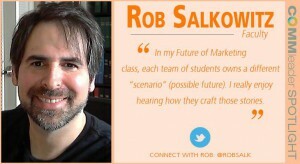 Take my Future of Marketing class and find out! I’m a slave to my tablet. I enjoy drawing and playing guitar – despite limited skills at both. I teach an MCCN elective called “Innovation Communities” that tracks some new ways that people are using online communities harness the power of distributed teams on the Internet to create new innovation and solve tough problems. I also teach an MCDM elective that is a skills-based “get your hands dirty” class on programming and data science for online communities for people with no previous experience. My classes have very different styles. My innovation class is a mix of lectures and case studies. I have a background of teaching at the business school at MIT where I did my PhD and I love the “case method” when it can help students puzzle their way through tough questions. The data science class is more lab-based. My general philosophy emphasizes application of skills toward solving real problems that students actually care about. As a student, I hated busy work and I refuse to inflict it on my students. All of my classes are project based and I don’t give tests of quizzes. Ideally, everything you do or write in my class will be something that gets you closer to solving a problem you have outside of class. My classes tend to be front-loaded in the sense that I try to give students the tools, concepts, and skills as quickly as possible. Once we’ve got those, the class switches into project mode as I encourage and work closely with students and they apply the stuff we’ve learned toward solving problems that they care about and that are meaningful to their personal or work lives. As a teenager, I cleared land on Vashon with two Tibetan monks and a drunken supervisor. That was exciting. My favorite was probably being part of the teams that conceptualized and built the Ubuntu operating systems and the One Laptop per Child projects. I’ve got no plans to head back to the startup world but watching a project you’ve poured your life into take off enormously is an absolutely incredible experience. Every assignment in my classes build on the previous one. The last assignment is always a culumnination of the work that students have done and it’s always the best. After final presentations in my innovation in the class in the spring, I was beaming for days. My Comm Lead students brought itand I continue to be impressed and inspired. I love hot springs and hot tubs. My favorite place to destress getting myself into some hot water at Banya 5. Afterwards, maybe tea and a game of chess upstairs? I like gnarly messy, food with as much going on as possible. Okonomiyaki is one of my favorite foods to make at home: cabbage and pancake batter with tons of veggies, tofu, tempeh, yakisoba, held together with an egg and covered in nori, and brown sauce, and mayo. The more the better. Also… Paseo… Is it really closed?! The Grieg Garden is right next to the building, right in the center of campus, and nearly always empty. That always kinds of shocks me. Also, the coffee at Parnassus is better than what you can get elsewhere on campus and I’ve been happier since I’ve figured that out. I was suspended from middle school for public displays of affection and insubordination. I’m proud of both. Before starting the MCDM, I was a print journalist in Washington, DC. I moved here for the program and haven’t looked back! Most recently I was an editor on the homepage of MSN.com. This degree helped me make the jump from old media to new. The MCDM taught me to be an early adopter. I’m not intimidated by the latest fad or digital tool. Trying something new is always an opportunity for learning, even if it’s something that burns bright for a few weeks and fades away (I’m looking at you, Ello). I also stand by my unpopular opinion that Google Wave (RIP) was a great classroom tool. Digital Law and Policy made me consider adding a law degree to my resume; I loved it so much. I still think of the Psychology of Digital Media class every time I go through an online checkout process. The people I’ve met here! I couldn’t have taken the steps I’ve made in my career without the aid of our vast student and alumni network. If you have your eye on a company in Seattle, chances are there’s someone in the program that works there. Also, we started a soccer team that is nearing its 5-year anniversary. Go Squirrels! 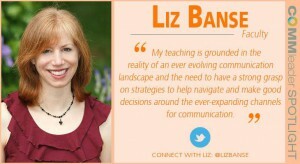 Manage and create content that is compelling, delightful and educational. I’m a politics nerd at heart and I believe that a healthy democracy is an informed democracy. Digital media is endless opportunity to inform. I find it fascinating that while Twitter is such an invaluable tool for communication among news types, its monthly active user rate is crazy small in comparison to other media platforms. That Twitter users are operating in such a tiny bubble of the internet is a bit of a metaphor for the way we all choose to communicate online. We stick to our networks and assume everyone is listening, when in fact that’s not always the case. I feel I owe this program so much; from the networking opportunities it has given me, to the friendships I have formed here. It’s a great group of professionals and I continue to be honored to be a part of it. 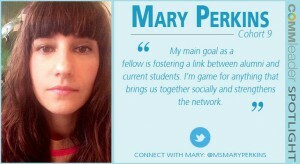 My main goal as a fellow is fostering a link between alumni and current students. I’m game for anything that brings us together socially and strengthens the network. I’m attempting to carry the torch started last year by 2014 Alumni Fellow Katherine Turner and am organizing our second movie night. Any student or alum can submit a short movie made during their time in the program. We screen them all at the Jewelbox Theater in Belltown, and it’s a really fun evening for the community. I’m hoping this will become an annual thing. I lived in Japan for two years and the biggest joke to play on a foreigner was to make them taste natto (fermented soybean paste). Some eat it every morning with rice and swear by its health-boosting powers. I am not one of those people. 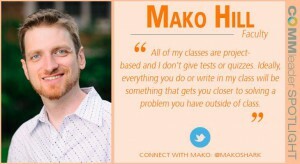 I do digital marketing of the inbound kind for a center at the University of Washington. I really rock a 24-checkbox WordPress advanced settings configuration panel. But seriously, I think the program helped me put digital trends into a deeper context and gave me more insight on how the web increasingly shapes all areas of life (and even thinking). It also gave me a good toolkit to approach digital communication problems more strategically. Hanson and Mac’s class Narratives and Networks was great because it combined creative exploration with community-building. As a social media immigrant (as opposed to a native) it was interesting to see how online storytelling and social networks could work together. I also liked Andrea Zeller’s content strategy class, it really helped me combine many of my digital skills under one umbrella and use them with purpose. Though I distinctly remember a few not-so-favorite times when I was up editing at 11 p.m. with the babies crying upstairs, writing and editing for Flip the Media was a great experience. 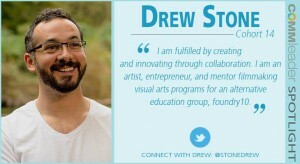 It really opened up a wide and unexpected network for me and gave me great creative freedom. Plus, I even got to go to SXSW and stay in a completely pink room for a while. But that’s another story. More of a life goal but applies to my use of digital media as well: Be ashamed to die until you have won some victory for humanity. Intrigued by: can multimedia storytelling save newspapers? Curious to try: 3D printing; (Still) trying to understand: Bitcoin; Concerned about: printing of new organisms; Pondering in idle moments: will my (very young) kids ever drive a car? Digital media moves so fast, what I think is cutting edge is probably already outdated. Staying close to the program as a fellow is a way to keep me exposed to new ideas. 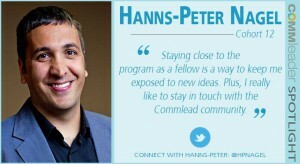 Plus, I really like to stay in touch with the Commlead community. As former Flip editor and the one responsible for the re-design, I’m helping out with Commlead’s student blog and supervise independent studies. It’s not strange, just disgusting: haggis.